Because the Oklahoma City Thunder managed to win Game 1, their problems from that game were overlooked. They made some errors, especially with regard to their lineups. The Thunder started the game with two bigs even though Miami’s center was Chris Bosh, and this was a large factor in why they fell behind by 11 points in that game. With the same lineup, they fell behind 16-2 in Game 2. According to PopcornMachine.net’s Gameflow, the Thunder’s two-big lineup was a -17 for the night, including a -14 in the first quarter. What’s the problem with Oklahoma City’s lineup? It features two bigs, Kendrick Perkins and Serge Ibaka, even though Miami’s bigs are Chris Bosh and LeBron James. This leads to matchup problems for the Thunder. Perkins has to guard Bosh while Ibaka — who can’t be expected to defend James — is stuck on Shane Battier. This is the worst assignment for Ibaka because he wants to be available to protect the basket, attempting a block on every drive. As a 3-point shooter, Battier drags him away from the rim. This was a problem from the first play of the game. Here, the Heat are running a Wade-Bosh pick-and-roll, of which Perkins is a casualty. He isn’t quick enough to hedge and prevent Wade from getting into the lane. As Wade attacks the rim, Ibaka leaves his man to block Wade’s shot, leaving Battier wide open in the corner. Wade makes the fantastic pass and Battier knocks it down before Russell Westbrook can rotate over. If Ibaka had been defending Bosh, he probably could have prevented Wade’s drive. Because Ibaka got burned helping on the first play of the game, he was hesitant going forward. When Wade subsequently drives to the lane, he doesn’t help. That’s exactly what happens here. Wade breaks down Kevin Durant at the top of the key and penetrates. Ibaka can’t leave Battier in the corner, but Perkins doesn’t have the speed to be an effective help defender. Wade gets an easy dunk. 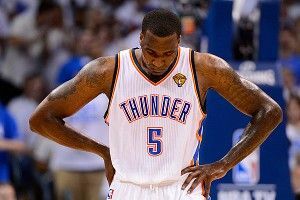 Unless Joel Anthony is on the court for the Heat, there is no matchup where Perkins has the advantage. If the Heat had a true post player, Perkins could be an asset, but he can’t effectively guard Bosh. Here, Bosh makes the catch at the elbow, faces up on Perkins, and drives right at him. Perkins has no chance to defend him and he is forced to commit the foul as he drives the lane. Even in transition, this two-big lineup becomes a problem for the Thunder. Ibaka runs straight to the rim to protect it, but Battier runs straight to the corner, looking for the ball. Wade finds him and Battier makes a second wide-open 3-point shot, finishing off their 16-2 run and forcing the Thunder to call a timeout and make a substitution. After two slow starts, Oklahoma City coach Scott Brooks needs to change his lineup, taking out Perkins and putting in Harden. I don’t advocate for letting the opposition dictate your lineup, but when staying big puts the team at a disadvantage, Brooks needs to make a change.